Gotenburg Wheelchair sports club (Göteborgs Rullstolsidrottsförening) is a sports club for members playing wheelchair floorball. The majority of our members have been playing wheelchair floorball for several years in the team INVALIDOS. 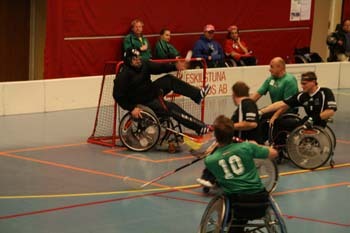 We formed our own association in 2007 to develop our game and play wheelchair floorball in Gothenburg. Our association conducts training and competition activities, both on exercise and elite level for children and adults. We train twice a week, and the purpose of our training sessions are anything from exercise players to have fun and get moving together by their own ability and also to conduct training at the elite level of our championship players. Send us an e-mail for more info!